The challenges and investing opportunities presented by India -- a country of 1.2 billion people -- are vast indeed. (MONEY Magazine) -- My great-grandfather left his little village in India more than a hundred years ago. When I visited it recently as part of a two-week reporting trip, I found that, except for the ubiquity of mobile devices, little had seemingly changed. The economy has been growing at better than a 7% clip for years, more than double the global rate. Yet that might not be fast enough to reverse India's staggering poverty. More than half of the country's 1.2 billion people live on $2 a day or less. At the same time, India is getting richer. Over 50 million Indians have annual disposable incomes between $4,200 and $21,000, and this consumer class is expected to grow by a factor of 10 over the next decade or so. India is also young: The median age is 26, and teens and young adults are digitally savvy and aspire to higher education. "We have the workforce for the world, not just for India," says Sam Pitroda, a famed telecom entrepreneur who advises the prime minister on infrastructure issues. 0:00 /2:47Will emerging markets save the world? India is in the midst of a public building boom. The new airports are excellent, and the Delhi subway system is spectacular. Road construction has nearly doubled in the past few years, and the government wants to build faster. Yet corruption slows down everything. Simple transactions need layers of approval, providing opportunity for bribery that discourages foreign investment. Among the hundreds of Indians I met from all walks of life, complaints about corruption and inefficiency were common. Still, there was also a sense of inevitability about the benefits that will come from a large, increasingly educated population. "Unlike China," Pitroda says, "India's growth will be driven by domestic consumption." 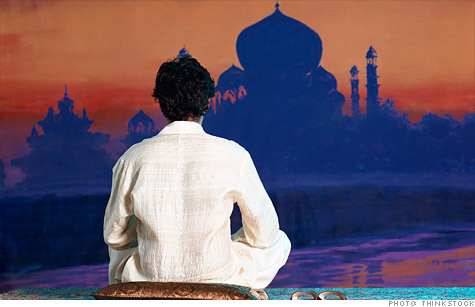 Does India belong in your portfolio? Yes, but you likely have enough exposure now through emerging-markets index funds (about 7% of assets are in India) and stocks of U.S. firms that do business there. That said, I returned home convinced that by decade's end, India will be nearing economic greatness. An aggressive, long-term investor should start buying during periods when stocks are falling. "India has four times the population of the U.S. but less than 10% of its per capita income," notes Jeremy Schwartz, director of research for WisdomTree, whose India Earnings (EPI) exchange-traded fund tracks 160 Indian stocks. "We think they're actually going to catch up over time."